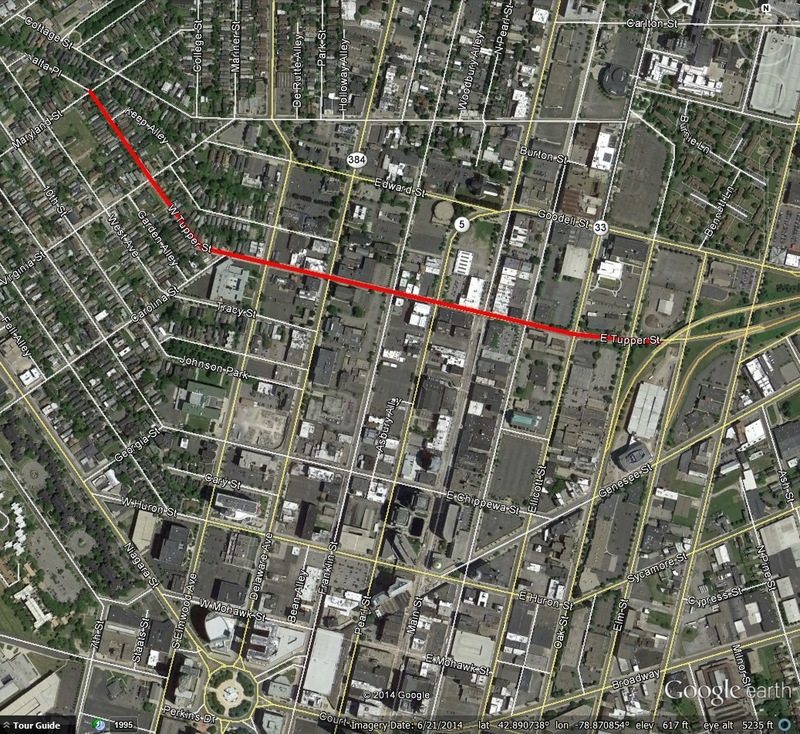 Tupper Street is an east-west road in downtown Buffalo that runs between Maryland Street and the Elm-Oak arterials. Tupper Street was one of the first streets added to Buffalo after the original plan for the Village of Buffalo was laid out by Joseph Ellicott. Samuel Tupper first came to Western New York in 1789 as a young surveyor. He came from Connecticut and served for many years as a surveyor. He worked on the Phelps and Gorman lands (between Lake Ontario and the PA State line, in the vicinity of Seneca Lake and the Genesee River), the Holland Purchase and as chief surveyor for the Connecticut Land Company on the “Western Reserve” in Ohio. Mr. Tupper worked for Moses Cleaveland and laid out the City of Cleveland. He also gave the city its name, deciding to name the city he was laying out after his boss. In 1804, when New Amsterdam was laid out by Joseph Ellicott, there were only 14 landowners here in Buffalo. In 1805, five more land owners were added, and Samuel Tupper was among them. He came to Buffalo to run a contractor’s store, which were the stores that took care of purchasing and dispatching supplies to American military posts in the West. He purchased inner lot 7 in 1805, which was at the northeast corner of Seneca Street and Willink Avenue (which became Main Street). In 1808, he purchased outer lot 17. He gave his name to the street north of his property on the outer lot and built his house at the corner of Main and Tupper. Judge Tupper’s house was the 2nd house burned during the War of 1812. Following the war, Judge Tupper built a large mansion on the site and served on a committee to investigate losses in Buffalo. In 1808, Buffalo was made the county seat of what was then Niagara County (breaking off from Genesee County). The first Judge was Augustus Porter, with Samuel Tupper and Erastus Granger working as his associates. Mr. Tupper was not trained as a judge, but was known to have capabilities and qualities that were required of society at the time. It was possible at the time to serve on the bench without legal training. His title was Associate Judge of the Common Pleas. He served as a judge until his death in December 1817. Judge Tupper had no children. An adopted daughter of his became the wife of Manly Colton, the Erie County Clerk. The Colton family occupied the Tupper house for many years following Judge Tupper’s death. Smith, Perry H. History of the City of Buffalo and Erie County. D. Mason & Co., publishers. Syracuse, NY: 1884.